Two volunteers with the Jacques-de Champlain Foundation have won second best project in the Association des médecins d’urgence du Québec (AMUQ) research competition. The AED G-MAP (Automated External Defibrillator Geolocalization through a Mobile APp) research project, a simulation lead by Valérie Homier and Joel Neves Briard, aimed to evaluate the efficiency of two methods by which cardiac arrest witnesses may be helped in finding a nearby Automatic External Defibrillator (AED). The simulation method used is known as a “randomised controlled simulation”. This method is often used in medicine and allows for the evaluation of multiple approaches in a given population within a single research project. After determination of their eligibility, participants are randomly divided into groups corresponding to each tested and evaluated approach. Fifty-two volunteer participants were enrolled and subsequently took part in the simulation held last June on the Montreal University campus. Depending on the intervention that was studied, some participants received verbal aid by an emergency medical dispatcher whilst others used the AED-Quebec mobile application. Those participants randomized into the control group did not receive any aid in trying to locate the nearest AED. Preliminary results suggest that verbal assistance was the most efficient method in decreasing the time needed to locate an AED and administer a shock to the victim. These findings were presented at the Emergency Medicine Scientific Conference, held in Montreal on the 18th and 19th of October 2017. More than 35 Quebecois scientific projects were presented at this annual event. 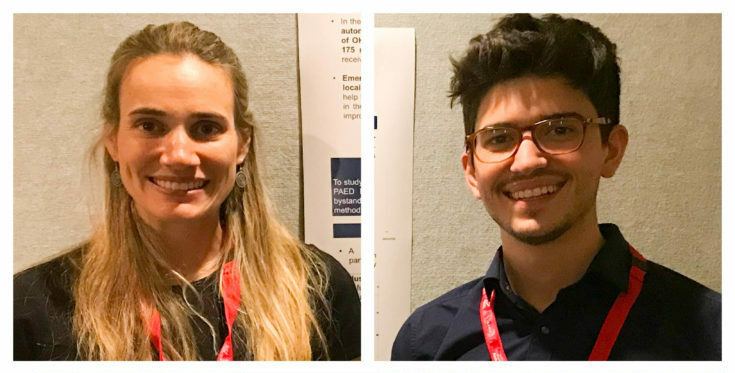 The Foundation is proud of the involvement of both Dr Valérie Homier, as supervisor of the project, and Joel Neves Briard, 4th year medical student and head researcher of this project. The analysis and conclusion resulting from the AED G-MAP study will follow in the next months. Study participants head to the simulation site to help first responders. Background: Public automated external defibrillators (PAEDs) are increasingly available in public spaces, but their use by bystanders of out-of-hospital cardiac arrests (OHCA) remains sub-optimal. Strategies such as emergency medical dispatcher (EMD) assistance and mobile apps have been developed in order to expedite the localization and use of available PAEDs, but their effectiveness has not been studied. 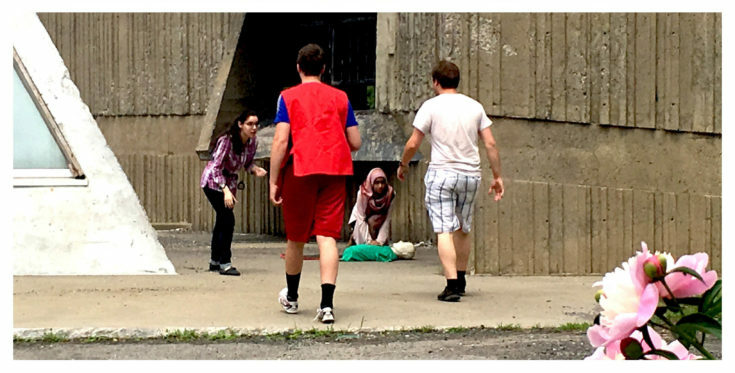 Methods: Participants were enrolled in a randomized controlled OHCA simulation on a university campus. After witnessing the simulated OHCA, they were instructed to locate a PAED, retrieve it and attempt defibrillation. The closest PAED was located 175 meters from the simulated victim. Participants were stratified and randomized to one of three groups: (1) no assistance in finding the PAED, (2) verbal assistance from the EMD, or (3) assistance from a PAED geolocalization mobile app. Time and distance traveled to shock delivery were measured. Participants were asked to complete a feedback form after the simulation. Results: Of the 52 volunteers enrolled in the study (46% male, 37.0 ± 17.0 years old), 17 were randomized to the no-assistance group, 17 to the EMD group and 18 to the mobile app group. Baseline characteristics were similar between groups except for prior knowledge of campus geography (12%, 53%, 33%, p=0.04). The percentage of participants succeeding defibrillation in 6 minutes or less was 18%, 53% and 22%, respectively. The average time required to find a nearby PAED and deliver a shock was respectively 519 ± 134, 381 ± 150, and 496 ± 125 seconds. Secondary analysis results are also reported. Conclusion: Bystanders witnessing a simulated OHCA were more effective in providing rapid defibrillation when the EMD provided the nearest PAED location. Further research is required to ascertain the external validity of these results and evaluate the real-life impacts of such PAED geolocalization strategies.